A story set on the American Frontier. In 1859 the opportunities for women were rare unless one wished to take a chance. Calico Benson, a gentle bred woman wanting the security of marriage and family, answered an ad in the “Matrimonial News,” where men were advertising for wives. Along with five other women, Calico set out on the Santa Fe Trail hoping to find love at the end of the trip. What they all found was nothing short of a hellish nightmare journey. 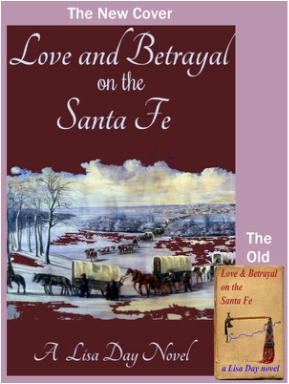 Follow Calico and the others while they seek safe haven at the end of the Santa Fe Trail. Join them as they meet the savage and the civil on their passage. Will their dreams be fulfilled or lost along the way? If the service bell rang any harder it would have jingled off the wall. Calico Benson just entered the large home’s kitchen. Her eyes went to the clamoring bell and sighed. Only a moment ago, she left the woman who already was demanding her return upstairs. Hastily Calico filled the tea kettle with water and placed it on the stove, thanking her lucky stars she found it still hot enough to heat the water for the madam waiting upstairs. She added a few more small pieces of wood for good measure. Calico began to arrange the tea tray while she waited. The bell again began its triad, leaving her no choice but to rush back up to the third floor, and see what the woman could now be demanding. Calico made mental note never to agree to fill in as the woman’s personal servant again. At the same time she wondered how Becky put up with the woman’s manner. She might be young, but running up and down three flights of stairs can wear out anyone. She spared another second to speculate how Beck’s sister might be fairing having her first child. Standing outside out the bedroom door Calico caught her breath. She knew enough about Victoria Allison Thurston to know not to barge into the room short of breath and appear even the slightest out of sorts. “One, two, three. Ready or not here goes,” she whispered, steadying herself. She turned the handle. “I want my tea served in the blue china today.” The woman’s body language announced that Calico was dismissed. Spinning on her heels the younger woman turned and left the room. Downing two flights of stairs, she grumbled that the lady of the house could’ve mentioned that before she began her first descent to fetch the ungrateful woman’s morning tea. By the time she hit the last step, she saw the butler had dropped the bi-weekly mail run onto the waiting table. She hesitated. Taking a quick glance up to the third floor, she decided to chance it. Nimble fingers flittered through the posts. Her whole body responded when she found the letter with her name on it. A smile deep and wide crossed her face as she slipped the missive into her worn apron pocket.